Sadhana Foundation is a registered Socio cultural organization working in the field of promotion of youth leadership , inclusive growth & for the welfare of the marginalized through improved, transparent & accountable governance as well as capacity building of various stake holders in Odisha. Amidst the abundance of resources and wealth the poor and the marginalized section of the society is in a struggle to get access to the basic needs of life and a space for dignified engagement with the rest of the social strata. There is need for qualitative and comprehensive work for development and welfare of poor, neglected, marginalized, underprivileged sections of people such as children, women, aged, scheduled caste, tribes and other weaker sections of the people of the society. 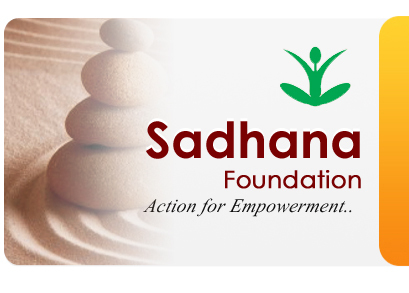 Realizing the gravity of the inequal social order and the governance deficit, a group of social activists have founded "Sadhana Foundation" – a trust for equality, empowerment and engagement. It will ensure intervention for change. Cultural Exchange Programme at Bhavnagar,GujaratBy SADHANA FOUNDATION on the eve of Republic Day. "Sadhana : A Cultural Foray in to Youth Leadership" on 8th Octobe r , 2015, at Rabindra Mandap , Bhubaneswar. 4 day Youth Leadership Training Program(North Zone) at Baripada Stadium,Baripada,Mayurbhanj from 23rd June to 26th June,2015. A Youth Leadership Training Programme from 30th may to 2nd June 2015 at Bandhagada,Kandhamal.